There are specific angles a cyclist’s joints will move through that will allow for optimum efficiency or power. Though these angles will change from one person to the next, they do not change simply because a person is of a different height. 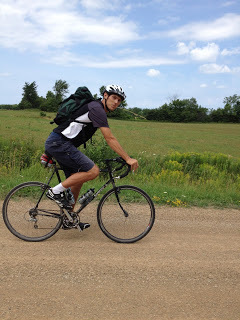 Hence, the bike geometry must change to allow for similar joint angles regardless of height. This means proportionally sized cranks. 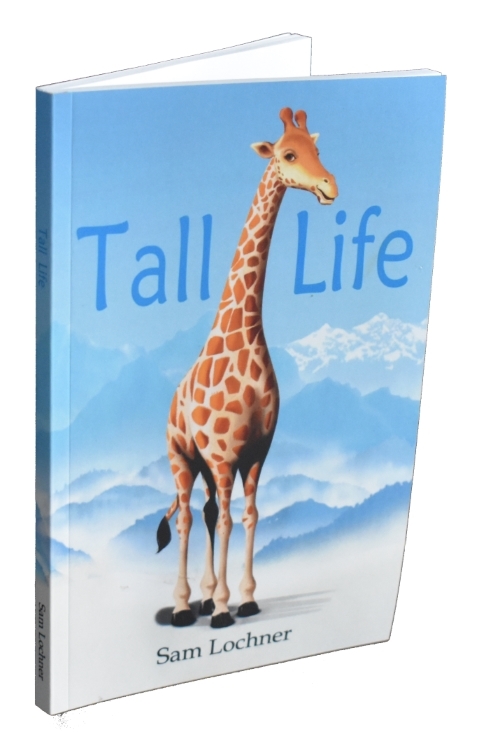 A useful analogy I have come across is that of a person jumping; just because a person is taller, doesn’t mean they should bend their knees to a lesser degree when they jump. Unfortunately, stock crank lengths vary insufficiently (most cranks are between 165mm and 175mm and sometimes 160mm and 180mm). 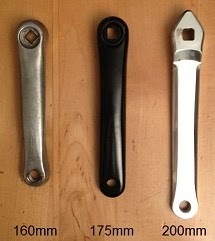 Recently, however, short run productions of less common crank lengths are being made. There are various calculations for getting a ball park idea of an ideal crank length. Some are based on inseam length, others are based on femur length. The inseam is a more common measurement and easier to take. An example of an inseam calculation as recommended by Lennard Zinn: Crank Length = 0.216 * Inseam Length (in mm). So a person with a 962mm (37.9″) inseam length (namely me), should start off with a crank length of 208mm. I selected 200mm cranks first because I wanted to be moderate about making such a huge jump from the standard crank length of 175mm that had previously worked OK for me, second because a 210mm crank is just too long for a standard bottom bracket height, and third because 200mm looks like it might become a standard crank length. 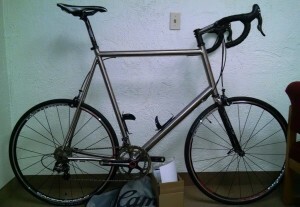 I bought my first set of 200mm cranks from High Sierra Cycles (http://www.hscycle.com). 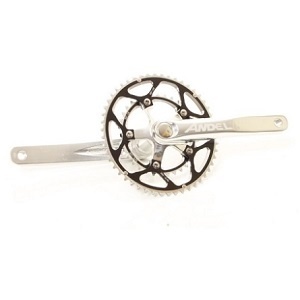 They sell a variety of cranks lengths and types including integrated, carbon, singles, doubles, compacts, and triples. Zinn Cycles (http://zinncycles.com) also does large cranks. 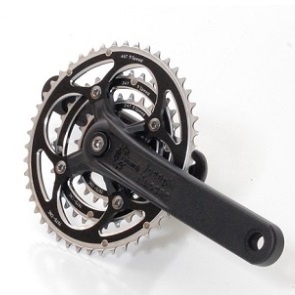 KHS is producing larger quantities of a 200mm integrated crank that can be purchased through Zinn Cycles. Other sources for longer cranks include http://www.universalcycles.com, http://www.davincitandems.com, http://www.zencranks.com, and http://www.customcranks.de. Besides being costly, the other problem with long cranks is that standard bicycle frames are not designed for them; bottom brackets are about the same height regardless of frame size. 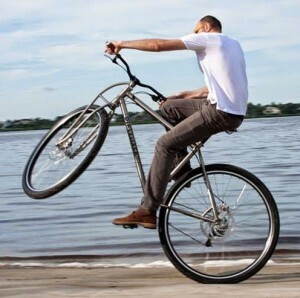 Thus putting a long crank on a standard frame leaves the pedal very close to the ground and may result in clipping the pedal on a rock or while banking. Another problem is that bikes designed for taller riders but with short cranks have slacker seat tube angles (smaller angle). 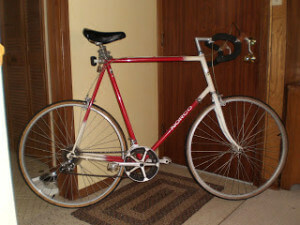 By putting on longer cranks, you will need to move your seat forward, effectively shortening the cockpit on a bike that was likely already too short. Its all related and can require a fair bit of adjusting. That being said, I did manage to make it work on my 62cm Surly Cross Check. 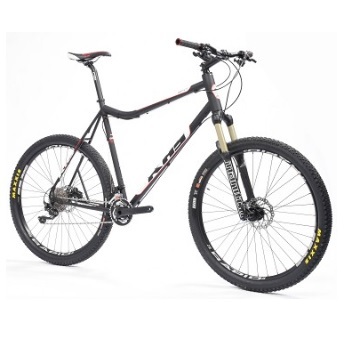 There are currently two stock bikes that come with 200mm cranks that I know of (editor: more now more in 2019!). 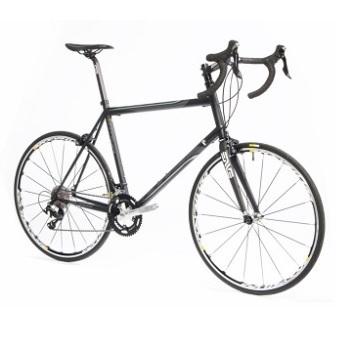 The first is the KHS Flite 747 (frame designed by Lennard Zinn) which I highly recommend. The second, The Big Apple (also by Lennard Zinn), comes in multiple sizes, is a fair bit more expense, and offers more upright riding geometry (more so for the larger sizes). If either of these doesn’t work for you, you can always go custom. However this can be expensive, particularly if you want multiple bikes, want to take your bike somewhere where theft or vandalism is a possibility, or are just plane hard on bikes. If you search around you can probably find some scientific data on the benefits of using proportionally sized cranks, but my own anecdotal experience was that I was able to put out significantly more power. A word of caution… leg length ins’t the only criteria for selecting crank length. One must also consider such factors as flexibility, type of cycling, the bike’s gearing, your preferred cadence, and any injuries or joint abnormalities (I have recently had to revert back to shorter cranks because of an impingement problem with my hip). That being said, I’m betting we’ll soon start to see more stock bikes with properly proportional cranks.